Sad to say, this book languished on my shelf for over ten years. I'm glad I finally got around to it since it looks at the immediate aftermath of Japan's defeat: ripped social fabric, corruption, severe shortages, devastated cities, a prostrate economy, physical isolation and military occupation. 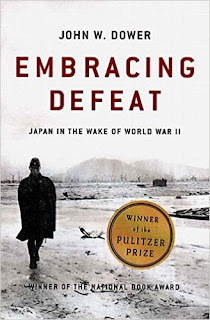 Dower has done a great job of studying what Japan went through during this period which was many things to many people. He has included fascinating vignettes of people, whether they were virtual unknowns or Japanese who in later years would become quite famous. They added context and substance to the experience of the occupation years. I've been interested since my undergrad days in Japan's unique history, so I was able to stick with this book despite its formidable 564 pages (not counting notes) but I will say the book is not for everyone. However, for people not even that interested in Japan but who ARE interested in the spirit and ingenuity of people faced with such a national trauma as few countries have suffered this can be a fascinating book. Illustrated with some photos.